The latest Dancing Times magazine is now on sale. 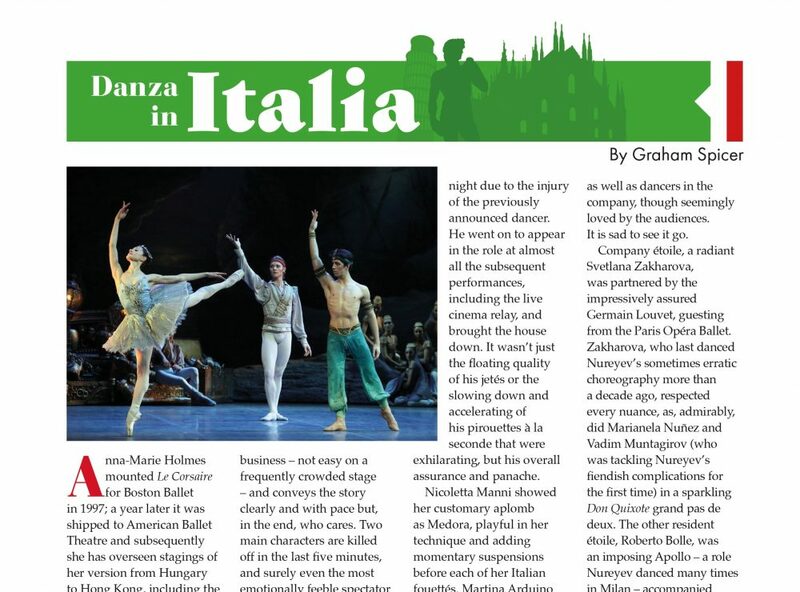 The August 2018 issue contains my latest Danza in Italia column with thoughts on the new Le Corsaire by Anna-Marie Holmes at La Scala, with company dancers Nicoletta Manni, Timofej Andrijashenko, Martina Arduino and Mattia Semperboni. The theatre also dedicated a series of evenings to Rudolf Nureyev to mark the 80 years since he was born and the 25 since he died, with company étoiles Svetlana Zakharova and Roberto Bolle, and guests from The Royal Ballet Marianela Nuñez and Vadim Muntagirov, as well as Germain Louvet from the Paris Opera Ballet. I also mention a contemporary dance festival held in Italy’s smallest tradition theatre, originally built as a theatre for marionettes in the mid-1800s, with refreshingly original choreography from Mattia Russo and Antonio de Rosa. 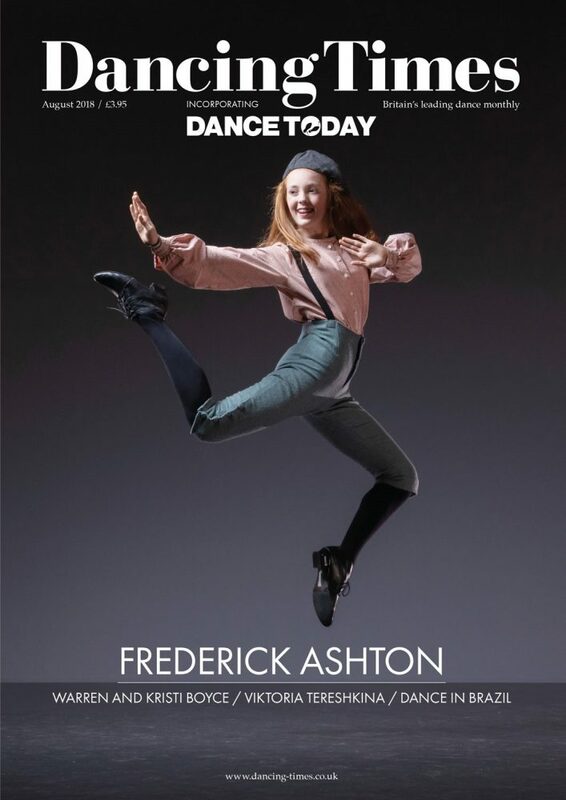 This year is also the 30th anniversary of the death of Frederick Ashton, and the magazine features articles by Alastair Macaulay, Alex Simpkins and Iain Webb about the great choreographer. Yet he immediately went on to say ‘But they’ve got the steps right; and that’s important. Someone could come along and illuminate it.’ He did not, however, hold out much hope as he said so. As he knew, most choreographic creations are fragile. Even some of the works that seemed most indestructible and cast-proof can fade for one reason or another. With a shrug, he thought that people might still go on dancing La Fille mal gardée in years to come. About the survival of others, he was sceptical. IS: It is considered that if a ballerina has Giselle in her repertoire she can’t do Kitri in Don Quixote. You do both. In part three of her series on dance in Brazil, Fátima Nollen looks at Grupo Corpo and the São Paolo Companhía de Dança. Alex Simpkins on Frederick Ashton as choreographic innovator. In the final instalment of his series of Soviet ballet from 1924 to 1941, Gerald Dowler looks at “ballet fraud”, the attack on the ballet The Bright Stream. Phoenix Dance Theatre’s Vanessa Vince-Pang is the August Dancer of the Month. Talking point: Iain Webb, director of Sarasota Ballet, remembers Frederick Ashton. Plus news of Tanztheater Wuppertal, dance at the Edinburgh Fringe, Mark Morris Dance Group UK tour, Brighton Tap Festival, Greenwich Dance, Southbank Centre’s Unlimited festival, Balanchine celebrated at New York City Center, and Matthew Ball. Reviews of Birmingham International Dance Festival, Ignition Dance Festival, Dresden Semperoper Ballett in William Forsythe, Ballet Theatre UK’s Ten Year Anniversary Gala, Opera North’s Kiss Me, Kate, The King and I, Nederlands Dans Theater in Crystal Pite. International reviews with Pacific Northwest Ballet in Paris, the Paris Opéra Ballet in La Fille mal gardée, Alexei Ratmansky’s Harlequinade for American Ballet Theatre, Hong Kong Ballet, a tribute to Jerome Robbins at Les Etés de la danse. The August Issue of Dancing Times also contains obituaries of Gillian Lynne and Colin Ross.